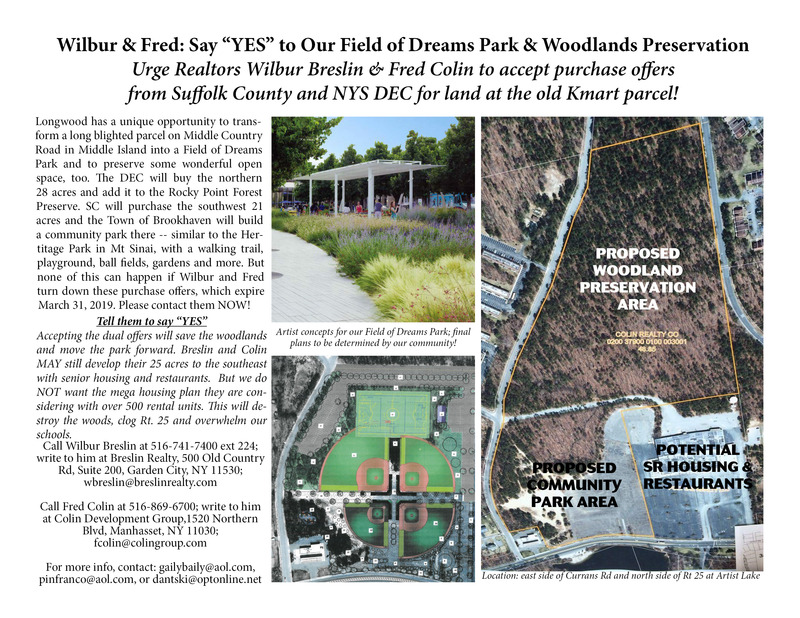 Longwood has a unique opportunity to transform a long blighted parcel on Middle Country Road in Middle Island into a Field of Dreams Park and to preserve some wonderful open space, too. The DEC will buy the northern 28 acres and add it to the Rocky Point Forest Preserve. SC will purchase the southwest 21 acres and the Town of Brookhaven will build a community park there — similar to the Hertitage Park in Mt Sinai, with a walking trail, playground, ball fields, gardens and more. But none of this can happen if Wilbur and Fred turn down these purchase offers, which expire March 31, 2019. Please contact them NOW! Accepting the dual offers will save the woodlands and move the park forward. Mr. Breslin and Mr. Colin MAY still develop their 25 acres to the southeast with senior housing and restaurants. But we do NOT want the mega housing plan they are considering with over 500 rental units. This will destroy the woods, clog Rt. 25 and overwhelm our schools.